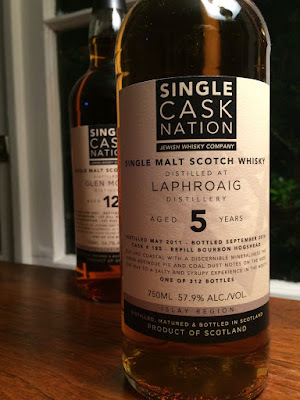 Single Cask Nation Laphroaig 5yo (57.9%): The second bottle I will be tasting today from recent Single Cask Nation releases is a five year old Laphroaig. Yes, exciting..! The whisky in the bottle is distilled in May 2011 and aged in a refill bourbon hogshead before being bottled in September 2016. The cask was numbered as #185 and 312 bottles have been made available. Palate: Hot... Barbecued green banana peppers, juniper berries and new make spirit. Water needed... Even a few drops suffice, it's definitely less layered than the nose but still pretty enjoyable. Peaty new make, cracked black peppercorns and bitter greens. Sea salt, ash, Concorde pears and olive brine. Toasted rosemary and dried lavender. Finish: Long... Black pepper, alcohol burn and salt.